You are compiling in Debug mode. Compile in Release and there should be no console. You can ignore those messages anyway. You can use any compiler that works for you. It doesn't really matter if it's 32b or 64b. The reason for why it won't work with MinGW 32b is that this package is bugged. It would be perfectly viable otherwise. It makes me a little bit sad that you don't trust me and you want to compile the program yourself. I compile the versions from the GitHub. I do this with all programs, of which I like to have the latest versions. Provided, of course, there are GIT or SVN versions. And I never make debug versions, only release versions. Debug versions would be of no use to me. The message 'libpng warning: iCCP: known incorrect sRGB profile' I get no more after I 'reset.png' have loaded into Photoshop and saved again. I'm convinced you weren't building in Release mode. I've just checked with MSVC 2015 and it didn't work because of incorrect entry point. Try updated CMakeLists.txt. It works for me and there is definitely no console in Release build. That libpng warning seems to be caused by embedded color profile. You probably fixed it accidentally by saving with different settings. I'm convinced you weren't building in Release mode. I know the difference between 'Release' and 'Debug'. We may use different methods to compile, or there are differences in the installations. 1. 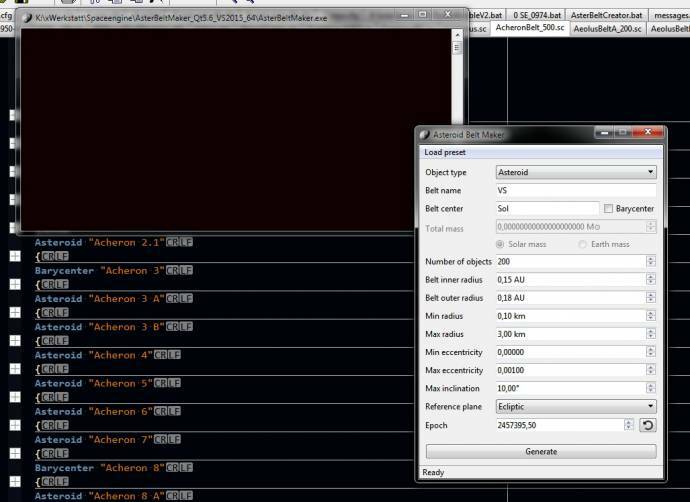 'CMakeLists.txt' open with 'Qt Creator'. When I run the program, also a console opens. And if I create a script and save, I get this message. When I run it directly in 'Qt Creator', I get this message also. You probably fixed it accidentally by saving with different settings. I don't normally use Qt Creator but I've tried building with it and console shows up. 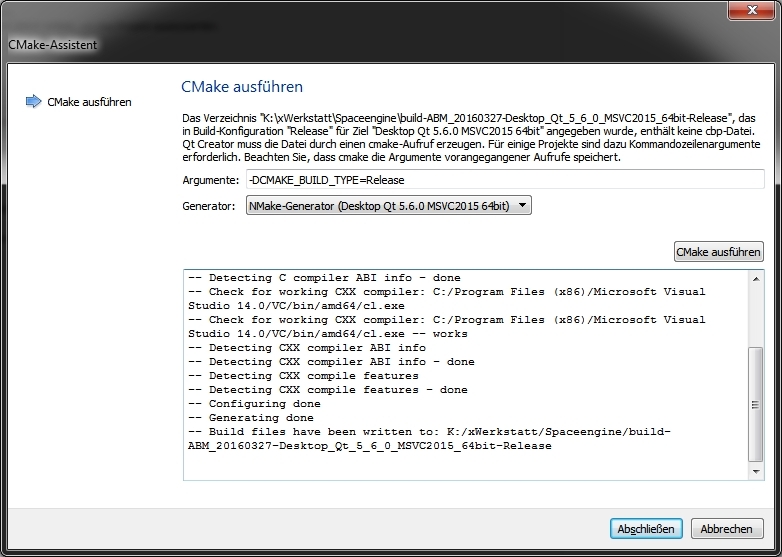 I think you should just use cmake or cmake-gui and generate visual studio solution. I tried it, and it works. However, I find it easier with Qt Creator. I now use MingW32. Well say so, asteroids generation software (AsterBeltMaker) was a great success and version and it is practice the last, a window with custom icon. 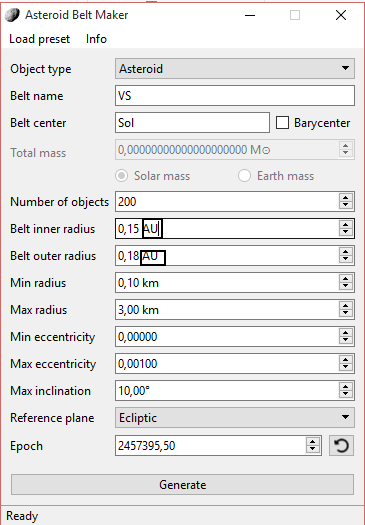 Small suggestion, in the window, would be practical for example choose the units of distance for the rings if we want to do around a planet in 3D, also, a checkbox if it puts a space between the name and the number (for example if I want Sol D1, Sol D2,...). In fact, want it to edit the software for the French translation, good already I presume that need permission but what edited file (I have Notepad ++) ? Thank you and good continuation. 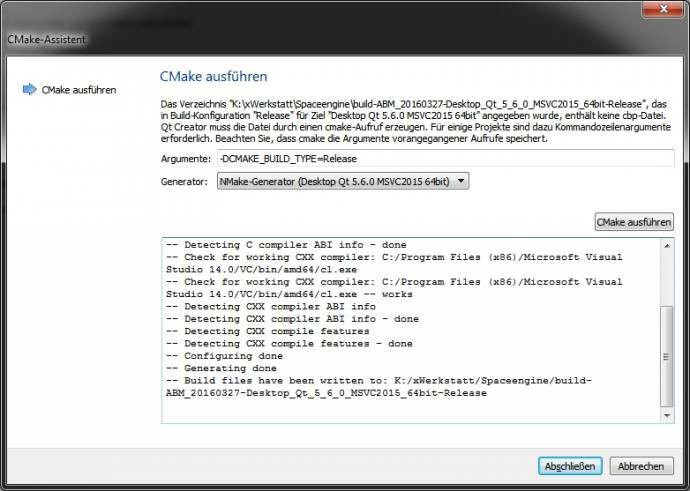 Przeszczep, I download the source code that you have set and modify files but how to test the program and then how to save the .exe program and like to do what you did ? Version 0.24 of my AsterBeltCreator published in the opening post. The script now speaks English and German! The method is not very optimal, but could be used for each language. "Inclination to the reference plane in degree"
These parameters are necessary to adjust the orientation of the asteroid belts in space. And the parameters are now written to the beginning of the generated script. Slown down please. I'm still behind with features and you are adding new ones. Anyway, there is a new release with translation support available. If you want to provide a translation, download a .ts file from here, fill it out and send to me. I'm a bad developer and I didn't include comments, so you'll have to figure it on your own where each string is used. Sorry. JackDole, I stole parts of your German translation. I hope you'll forgive me. Feel free to create a complete one. It requires a bit of programming knowledge and if you don't know how to do it - don't do it. You can use your Notepad++ to edit lang_fr.ts from the above-mentioned link. Then send it to me eg. via pm and I will include it in next version. I have the right to use AsteroidBeltCreator for my systems addons ? Do I have the right to use AsteroidBeltCreator for my systems addons? I think yes because typing catalog for thousands of asteroids takes a long time. Of course. The script has therefore been published here. 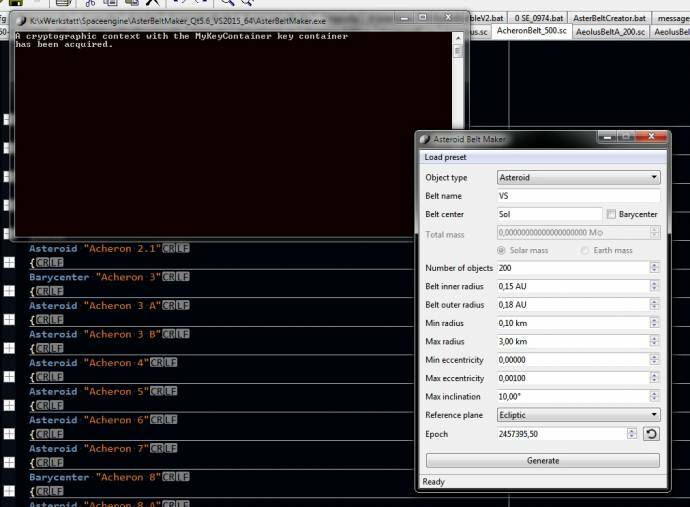 Small patch for the Python version of the 'AsterBeltCreator'. A wrong string was displayed in a parameter query. File in the opening post. Long awaited: A new version of the AsterBeltCreator! At the suggestion of LookAtDatDakka I have made some changes to the Python version of 'AsterBeltCreator'. So there is a new version in the opening post. - Order of the parameter query changed. Now parent object is asked first. - Numbering offset added for dwarf moons. So that with an offset of 1000, the numbering starts at 'ParentBody.D1001' instead at 'ParentBody.D1'. 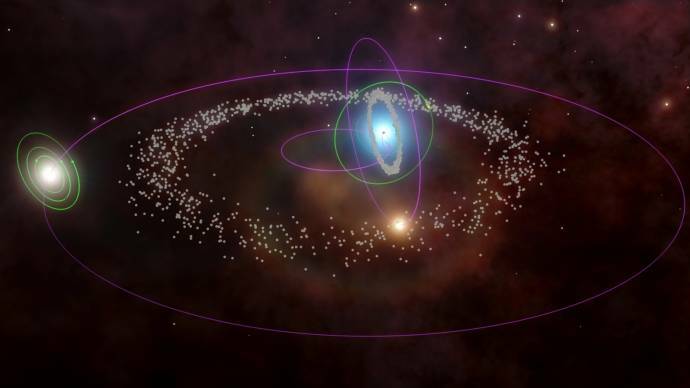 - Binaries and moons of dwarf moons disabled. If they are desired, this can be changed in the script here. Added an additional parameter query. - Shall moons and binary partners be classified as 'DwarfMoon'?